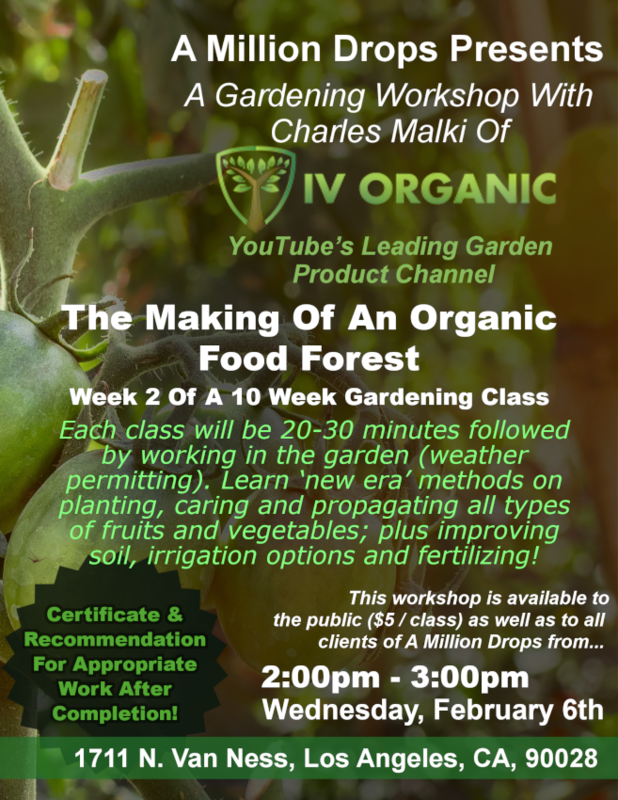 For the next ten (9) weeks, Charles Malki will be continuing to teach his ten (10) week class on important plant/ tree care concepts: The Making of an Organic Food Forest. Concepts taught will include, but not be limited to, learning ‘new era’ methods for planting, caring & propagating all types of fruits & vegetables; plus improving soil, irrigation options & fertilizing. The classroom lesson will last about 20-30 minutes, followed by a 5-10 question quiz, then followed by 30 minutes practical gardening time. Those who participate in the classroom lesson will have the added incentive of $5, which upon completion of all 10 classes can earn a $50 gift (what type of gift has not been decided yet). Outside guests that participate will be charged $5 for participation, plus a plant gift from A.M.D. to offset their investment (such as our succulent arrangements… we will always have excess plants, especially as we go into spring & summer in our garden). Additionally, those who graduate the class will receive an IV Organic Certificate of Completion, plus recommendation for any horticulture or nursery-based business; as it is expected that those who complete the course to have an understanding that will place them in the top 10% in the industry. There will be make-up courses for those who miss one of the classes for the following four (4) weeks, before repeating the course again to the next group of interested participants.